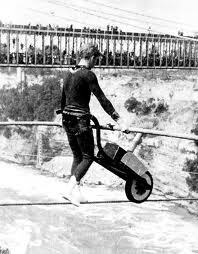 Charles Blondin crossing Niagara Falls. Would you trust him? Jean François (Charles) Gravelet-Blondin (aka “The Great Blondin” 1824–1897) was a French tightrope walker and acrobat. So popular were his exploits on tightrope that the art itself was known as “Blondin.” He was known to be very likeable, charismatic and popular for his entire life. He accomplished many daring tightrope walks. He performed at the Crystal Palace in London on a rope 70 feet above the ground stretched across the central transept turning somersaults and on stilts. In Dublin, Charles stretched a rope 100 feet above the ground at the Royal Portobello Gardens. He crossed the Edgbaston Reservoir in Birmingham England in 1873. He came to the United States in 1855. While here, he performed mostly with the Ravel troupe in New York City and became part owner of a circus. On June 30, 1859 he became the first man to walk a rope across the Niagara Falls. He stretched a rope 1100 feet long, 160 feet above the water. He made many trips on this rope, first by himself, and later he took his manager on his back. He went across performing various stunts: blind folded, in a sack, trundling a wheelbarrow and on stilts. On one crossing, he stopped in the middle and, using a portable stove, cooked an omelet while standing on a chair with only one chair leg on the rope. Other reports indicate he lowered a cooked omelet down to the boat, Maid in the Mist, where someone ate it. While he was trundling his wheelbarrow back and forth he would take his manager, Harry Colcord, in it. After making this passage from one side to another, he would stop at the New York side, or the Canadian side and ask the crowd if they believed he could take a man across the falls in his wheelbarrow. The overwhelming response in the highly charged and exuberant crowd was, “YES!” They cheered The Great Blondin on; the crowds were excited. They had seen him carry his manager on his back and in a wheelbarrow across the rope. They knew he could do it; they agreed he could do it. This is a man who had an outstanding sense of balance. He was a tightrope walker who lived well into his 70’s. Nevertheless apparently they had every reason to trust him. If anyone could do it, he could do it. He pointed to a man and said, “You sir, get in the wheelbarrow.” He never encouraged a single rider. It was not that they did not believe in him. They had literally seen him accomplish the feat. They could talk and very openly and candidly agree with others that he had accomplished the feat. The problem was that they did not really believe. Ladies and gentlemen, the demons of the world all believe in God the way these people believe in God. They have seen God. Demons have seen God perform miracles. They have seen God create life. But they do not believe. James 2:19 speaks to us about this problem. It says, “Thou believest there is one God, thou doest well, but the devils also believe and tremble.” Like the multitude standing before God cheering Him on as they did Blondin, anyone can, say they believe. The difference between them and the manager is the wheelbarrow. You have to get in! If you believe you have to get in the wheelbarrow and trust Christ with your life. Jesus is the eternal Blondin. Jesus has traversed the expanse between Heaven and Earth on the most tenuous of tightropes – human life. He passed to Earth in the body of a babe. Then He was transfigured back into Heaven as a resurrected man. First John 5:11 tells us that Jesus, God’s Son, is how God the Father chose to help us across the expanse from disqualification to acceptance in Heaven. All we have to do is believe. John 3:18 tells us that those who believe in Jesus the Son of God are not condemned to eternal torment. However, those who do not believe are already condemned because they do not believe in Jesus. The scriptures are clear. To get to Heaven, you have to believe in Jesus. Further, this belief is not some verbal assertion that goes along with the crowd. Your belief has to be unique. Your belief has to trust your life in the hands of your Savior. Another amazing thing about this belief is that everyone that does not believe will see it and probably call you crazy for getting into the wheelbarrow. Remember, they don’t believe. Get in the wheelbarrow. Jesus is asking you to believe.